In Sachin Tendulkar's last Test, Cheteshwar Pujara scored a fluent 113, Rohit Sharma scored an unbeaten 111 - 66 of those in an 80-run last-wicket partnership - but the biggest story of the match has been Tendulkar's 74. Not only that, but it was also the best innings of the lot, according to Pujara, because it was the center of such frenzied attention and answer to so many expectations. Add to it, the emotion itself of being near the end of what you have loved and done all your adult life. "I would say Sachin's innings was the best because he was playing his last game and it is not easy to focus and concentrate," Pujara said. "There is a lot of nervousness, and the way crowd was supporting - it was good on the crowd's part - but when you are in the middle it is difficult to concentrate so I would rate Sachin's innings as the best. "It is not easy to stay calm when you are playing your last game. I think there was a lot of expectation from him since he was playing in Mumbai and it was his last Test match. But the way he batted it is incredible and only he can do it I guess." Pujara was the fortunate one to have batted with Tendulkar throughout what seems like Tendulkar's last innings in Test cricket. "It was a very good partnership," he said. "Initially it was very difficult for me to concentrate because there was a lot of noise from the crowd, and I was just coming, and I didn't face any balls. He faced the first ball before me because [M] Vijay got out. He told me to just stay focussed. Once I played a few balls it was easy for me to bat then." When the partnership did end, it left Pujara asking for more, but not dejected. "It was disappointing but the way he batted I think it was really amazing to see him score those runs," Pujara said. "I always feel that he is always determined to score, and he might be as determined as he might have been in his first game and there are many things to learn from Sachin." Tendulkar's final intangible stamp on the Indian batting might have come in his last nets session. Over to Pujara for more. "Actually, the conversation was that I was not playing well in the nets to the balls going through me," he said. "I was struggling against the outswingers in the nets a bit so he told me that my right shoulder is opening up a bit, and I should be a bit side on. He also told me to have a little bigger stride, and I tried doing it once I finished my nets and it helped. But I think initially, as I said earlier, it was difficult to concentrate and keep all these things in mind so I tried working it out in the nets and I think it helped me a bit." There was praise for fellow-centurion Rohit too. 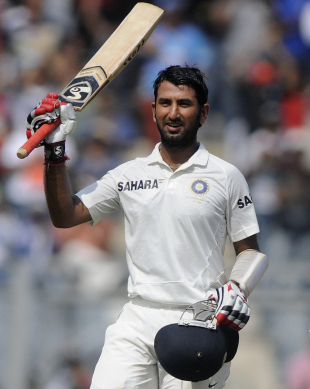 "I felt that the way VVS Laxman used to bat with the tail, he has done the same thing," Pujara said. "It was not easy to score runs. He was batting on 50 or 60  when we were eight down, and from there onwards to score a hundred it is a big achievement. And he has started off well, even in the first Test match so he is in good form. He has done well in the ODI format also, so I think he is doing really well."